QUITE what proportion of the UK walking and climbing community uses digital and electronic gadgets when out on the hill is hard to estimate. Reading the online trip reports on sites such as Walkhighlands and Scottish Hills tends to suggest a high figure, with each report illustrated by digital photographs (quite often to the point of tedium given their quantity and the inevitable selfie obsession), along with much mention of GPS devices and their accompanying waypointed route maps. Such sites form only a small part of the wider hillgoing world, but there is certainly now a lot of gadget and gizmo fondness. I’m surely not alone in having a couple of hill companions who, whenever they reach some (often minor) summit, are informed of this by a beep emitted from a plastic box held in their hand or dangling round their neck. Whatever the popularity of such things, there’s no doubt that I’m in the part of the hill world that has little or no dealings with them – and this occasionally leaves me feeling either old-fashioned or just plain old, even though I’m only in my early 50s. I’ve always been non-gadgety. Apart from a Kodak Instamatic acquired one Christmas during my early teens, I’ve never owned a camera and haven’t ever felt any great urge for one. Once in a very occasional while – if required to photograph a particular person met in a journalistic context, or some snow or rock feature which needs to be discussed with a colleague, I’ll borrow a camera and cart it up the hill. But a year or two can pass without any instances of this, and most of the time I’m content to try and remember what I see via the portable hard drive of my head, record it via writing and – this is the key point, perhaps – not forever be breaking my stride to stop and take snaps. Likewise, I’ve never owned or even borrowed a GPS, with the nearest equivalent being a Suunto Vector wrist altimeter, acquired as a 40th birthday present and used on most hill outings until it started going haywire after condensation leaked into the innards not long after my 50th birthday. Getting it fixed seemed to involve returning it to Finland at prohibitive cost, so I was back to an altimeter-less – and generally gadget-less – existence. All of which is a rather roundabout way of saying that, in my 30-plus years of hillgoing – and in the dozen or so years since GPSs became small and affordable enough to qualify as part of the ordinary hillwalker’s kit – there have been only two occasions when I’ve genuinely wished that I possessed such a thing. Neither time was a life-or-death situation (although the more recent example took place in conditions serious enough to require concentration and care), and both resulted in nothing more significant than a narrowly missed summit. But I’m the kind of person for whom a narrowly missed summit during a multi-hour hillwalk provokes a couple of nights of less than perfect sleep, so both times it was an irritating turn of events. The first instance was in the western Dales in April 2004. I was en route from Stirling to Coniston for a weekend with whatever the mother-in-law is called if you’re not married – bidey-in-in-law? – and with time in hand a detour was made along the Mallerstang road to the east of Wild Boar Fell. This hill – a 708-metre mix of craggy edges and boggy moorland – was one which neither I nor my better half had climbed, but she opted to stay in the car with what must have been a particularly engrossing book – Great Soups of Cumbria, or Twine, Trousers and Local Lore, something like that. So off I scurried, alone in what started as clear conditions. Cloud soon dropped to below summit level however, and following the eastern escarpment brought a collection of windbreaks and stone men, not marked on the only map I had – Landranger 98. Despite having done most of the ascent, I wasn’t at the trig point, located half a kilometre away across a tussocky plateau. It was only now that the navigational problem emerged. The Wild Boar Fell summit area is curious in that it never drops below 700m, so the Landranger portrays it as a large empty contour – empty, that is, apart from the trig located towards its western edge. And because I didn’t know where the stone men stood, I could be anywhere on almost a kilometre of the eastern edge, with the trig on a bearing ranging from north-west to south-west. By now the cloud was thick, giving no clue to what lay “inland”, so it was a case of trial and error. Working on the basis that I hadn’t come far along the edge, I turned the compass to 325 degrees and set off. With half a kilometre of fairly rough ground to cover, somewhere between five and ten minutes was the target time. Ten minutes duly came and went and the ground began to tilt away – I had overshot. No worries, simply reverse the bearing, go sideways a bit to increase the chance of hitting the trig on the return leg, and return to the stone men. Then it was a case of trying again, on a slightly different bearing. Again no joy – another quarter-hour was spent stumbling into a trigless fug and back. Third time lucky? Nope, again nothing. By now, standing at the stone men for the fourth time, it was becoming both annoying and time-critical. As long had been spent wandering the plateau as climbing the hill in the first place, and there was still the need to get down – we were soon due in Coniston and the bibliophile back at the car would be getting bored, cold and worried. Enough was enough, and for all that I had almost certainly walked within 20 metres of the trig on one of the forays, it had to be conceded that the damn thing hadn’t been found. So Wild Boar Fell remained unticked until that same July, when a clear-weather revisit on the next in-laws visit brought the summit without difficulty. I’d started to wonder whether the trig had been removed and the April search had been for something that didn’t exist – but no, there it was, standing among the tussocks as easy to find as a cow in a field. ALMOST a decade later, and a very different day on a very different hill. In early January 2014, Mike Adam and I headed to Beinn a’Ghlo for a midweek outing based on a reasonable east-of-Scotland forecast. The idea wasn’t to climb all three Munros, just the first two and return from Braigh Coire Chruinn-bhalgain by one of the off-to-the-side spurs – the south-west ridge leading to the ruined Creag-choinnich Lodge (a lovely spot), or the southerly option towards the good-viewpoint bump of Beinn Bheag. The promised brighter weather didn’t arrive until late afternoon, so for much of the time we were in standard messy Scottish winter conditions: dry apart from some smirr high up, cloud from about 800m (we dipped into clear air at the notch-like col between the Munros) and a steady but not strong westerly breeze. Snow conditions were similarly mixed – scoured enough on the upper part of Carn Liath to see us opt for crampons, then softer – and surprisingly deep in places – on the crest down to the col and up the other side. So far, so normal for January in the Highlands. But once above the ridge junction on Braigh Coire Chruinn-bhalgain, from 1000m or so (the summit is 1070m), we found ourselves in an eerie and almost blank-white world. Snow cover was 100%, the cloud was almost tangibly in-your-face, and it became increasingly hard to see the ground and to assess angles and inclinations. A whiteout, in other words. “Whiteout” is often misused, both by the media and by hillgoers, to describe blizzard-type conditions. While it’s not impossible that a blizzard can completely obliterate features and provoke severe disorientation, usually in such circumstances there are still some points of reference and it’s simply white-ish rather than a whiteout. The classic, genuine form tends – in my experience at least – to involve little or no ongoing snowfall and not much in the way of wind, either. Rather, there is a quietness to the weather, creating an other-worldly stillness fascinating in its matt-whiteness and scary, given that every foot-placement contains an element of risk not present in “normal” snowy conditions. It had been several years since I’d been in a pure whiteout – the last I could remember was on Ben Chonzie, where there was no unduly steep ground close at hand plus the backup, in safety terms, of a fence to be steered towards. Now, on the middle chunk of Beinn a’Ghlo, we were in the same situation but without any fences and with some steepish stuff on either side, especially to our right on the eastern slope. Mike and I slowed the pace – not that we had been racing along – and closed ranks for the stretch to the summit. We were on a fairly broad ridge where we had both been several times before, but that wasn’t a huge help given that seeing the ground was so tricky. There was a slight brightness to the left and – particularly, where the slope dropped away more abruptly – to the right, and we found ourselves almost tiptoeing along while doing an eyes-right thing like soldiers on parade, steering by the just-discernable cornice that marked the eastern edge. I knew there was a pre-summit cairn followed by the top itself – although couldn’t recall how far apart these stood. In due course we passed a small, snow-covered cairn and then reached a more substantial one. This too was buried, but still didn’t feel as big as it should, given that the “true” cairn just about provides shelter for lunch whereas this one didn’t seem to be high enough. So the bearing was checked and, tentatively, we pushed on to see what lay beyond. Three minutes later it felt like we were starting to head steadily downhill, although it remained hard to be sure given that angle-assessments were being done by feel rather than by sight. Dithering over possible summits didn’t hold much appeal, so after a brief discussion we turned on our cramponed heels and headed back – first to the “possible” summit cairn and then, a few minutes later, to the security of stonier ground where we could see what was what. Even up top it had been easier on the return leg as our imprints were just about visible – although this required constant squinting at the ground. But the safer terrain did come, and the rest of the day – finding the ridge-split and emerging into sunshine for the crossing of Beinn Bheag – passed without incident. By the time we reached Loch Moraig and started the drive home, the summit puzzlement had been largely forgotten and there was no discussion of whether we had climbed two Munros or just 1.99. It was only that evening, on crosschecking notes from earlier visits, that proper doubts emerged. It had taken us 37 minutes to reach the “summit” from the col, in heavy boots and crampons and walking through hard-work snow for much of the way. Various summer-condition outings – generally lightweight and shod in Walshes – had needed around 30 minutes from col to summit. Add in having stopped to regroup at least three times (I’m generally faster than Mike on ascent, while the reverse applies on descent), and our January effort felt too fast given the conditions, with something close to 45 minutes being more realistic. 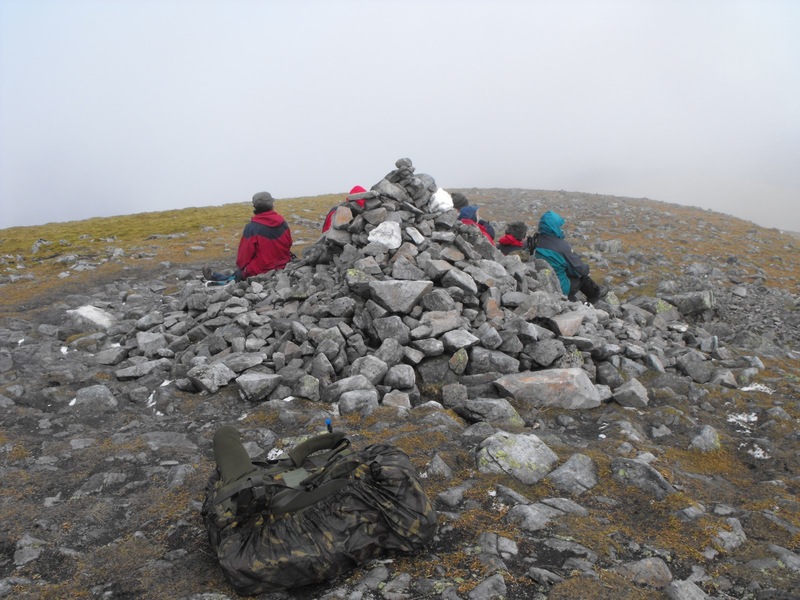 That, allied to the not-quite-right cairn, led me to think that the top hadn’t been reached – although it would be easier to assess had not different notes suggested that the time between cairns was once a single minute and on another occasion seven minutes. Are there actually three cairns, two preliminary ones close together and then a longer gap? If so, we must surely have visited the preliminary pair. But what to make of the going-downhill episode before we turned round? The ridge doesn’t dip much before the true top, so were we deceived in a sensory illusion kind of way and not actually going down very much if at all? Or were we on an iffy bearing and heading too far east, towards the side-slope? If the latter, it’s a good job we retreated when we did, as a missed summit might have ended up being the least of our worries. THERE’S only one real way to find out, and come the longer daylight (and some clear weather) the Old Bridge of Tilt circuit would seem to be in order: walk for a couple of hours along Glen Tilt, tackle Carn nan Gabhar by its back ridge (reached via a couple of useful bridges and an unmapped stalker’s path), then return along the standard route and stroll down the road at the end. A good day out and not excessively long – it took under eight hours when I did it in June 2009 – and with the considerable benefit of completely avoiding the long, boggy glen paths on the usual circuit from Loch Moraig. I’m pretty sure that will confirm our January non-summiting – but, to return to the more general point, would either this day or the Wild Boar Fell one have seen a different outcome had an electronic device been available to firm up the location of the actual summits? Almost certainly yes – but that in itself isn’t prompting me to rush out to visit my friendly outdoor gear stockist. One missed summit because of navigational vagueness every ten years feels like a reasonable “failure rate”, not that any hill day is ever a failure as there’s always stuff to be learnt and experience to be gained (often more so on days that don’t go according to plan). Pretty much every year I retreat from at least one hill because of more normal weather problems, time pressures etc, and it’s really only the near-miss aspect of the Wild Boar Fell and Beinn a’Ghlo escapades that make them feel more pointed. Heading down from halfway up tends not to provoke the same level of post-hill frustration. As for the Atholl episode, had I remembered (as I often do) to consult old timing notes before setting off, the idea that the true cairn could have been as much as seven minutes’ walk beyond the preliminary one might well have caused us to push on a little further. Also – and possibly even more of a factor on the day – was the realisation on top of Carn Liath that I’d left my compass at home. This is something I hardly ever do – on proper big-hill days I can only recall one previous instance – and it didn’t prompt a crisis given that Mike had his, which I borrowed to do the fiddly, fine-tuned navigation on the middle Munro. But if I got it wrong by a degree or two – as could well have been the case given the mysterious downslope – then there wasn’t scope for the cross-checking error-nabbing provided by having a second compass-wielder in the party. In retrospect, the worries about stepping over an invisible cornice were considerable and retreat in the face of uncertainty was the sensible option – the hill is always there for another day, and all that. But it does appear that on both the Ghlo and Boar outings there was scope for finding the top by older, more traditional long-hand methods – as indeed walkers had no choice but to try and do until the end of the last century. That said, there is no virtue in being Luddite for the sake of it: GPSs exist and are clearly useful in certain circumstances, provided that one doesn’t become fixated by the joys of the gadgetry almost to the exclusion of the hills themselves. It might well be that in due course, and given enough spare cash, I’ll join the modern world and buy one – and I’ve already asked a couple of GPS-owning friends about the merits and demerits of the models they have. Might, however, remains the operative word: I’m considering my options, as the saying goes. FOOTNOTE: While in the latter stages of writing the above, another outing – to Meall nan Tarmachan – brought a second dose of can’t-see-the-ground whiteout conditions. It was similar to the Beinn a’Ghlo version, but in terrain that was more complex and serious. This led to a genuinely alarming hour or so during which I couldn’t find a safe way down and the late-afternoon darkness was fast encroaching. In the end I made it, but undoubtedly ran the margins too tight for comfort and came very close to making a major screw-up. It’s debatable whether a GPS would have helped me to avoid – or to extricate myself from – that situation, as I knew with reasonable accuracy where I was. What I could really have done with was a set of whiteout-vision goggles (assuming for a moment that such things exist), but a GPS might at least have provided some benefit. What’s not debatable, however, is that the Tarmachan episode came closer than it should have done to ending with me either rescued or dead – so the gadget-buying options are again being considered. More on this – and on the perils of bad decision-making in winter – next time.